Ready? Let’s do this! 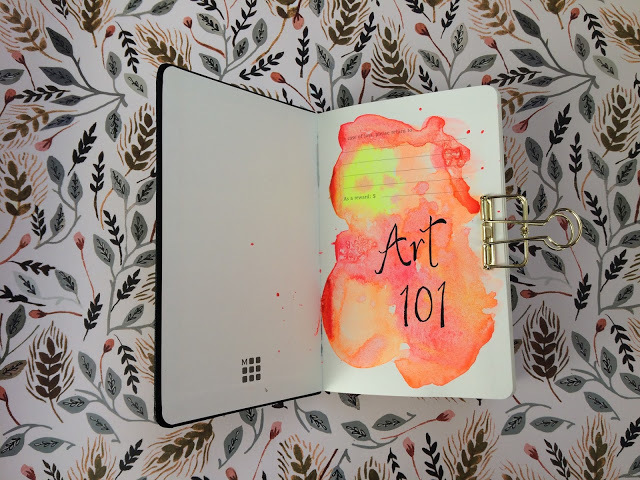 Welcome to the Season of Art 101. I am trying something new today. 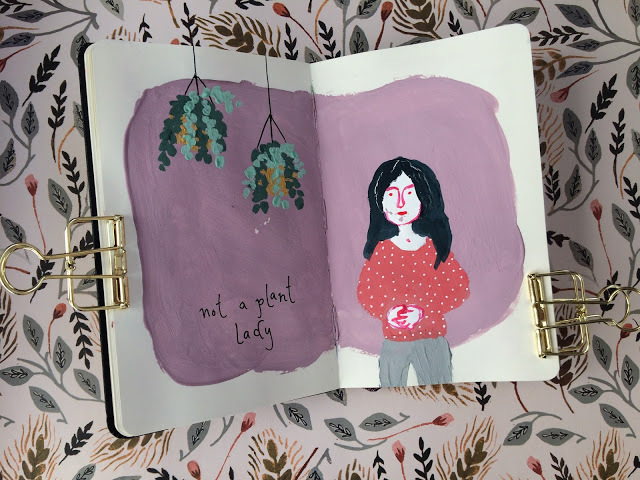 Since my Moleskine for this season is so small, I can photograph it against a pretty paper background. I think it’s a little bit too intense and will probably go for something calmer next week! at least I tried something new. 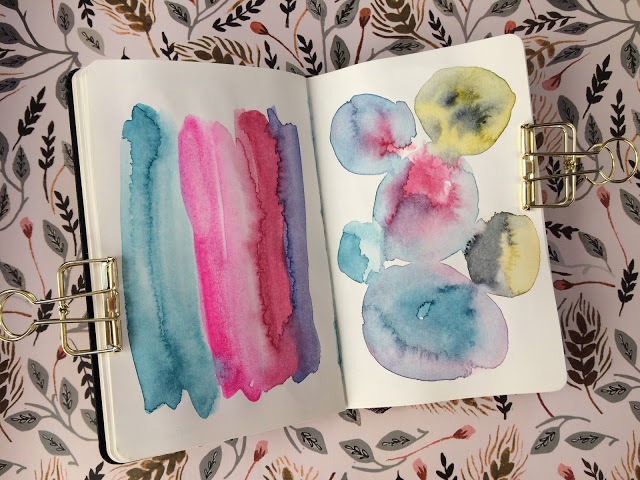 Art 101 is starting with one of my favourite mediums: watercolours. My love for them is everlasting. The first thing I do when I get a set is make colour swatches. 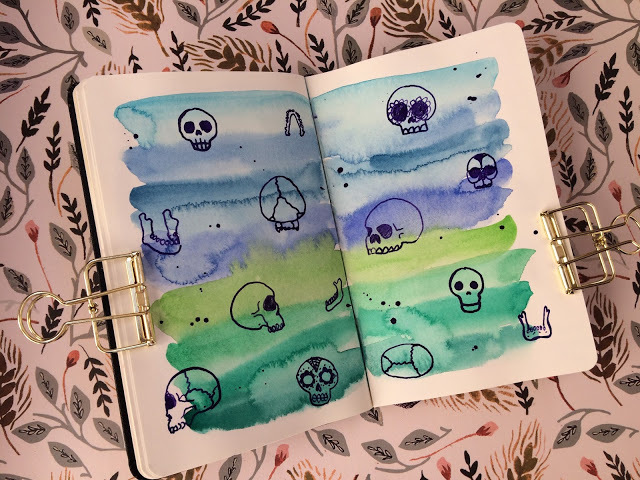 I just bought a few new sets so I tried them out in my journal. The set below is by Mungyo and this is in the order that the colours came in. Once I was able to see the actual colour of the pans, I switched them to how I felt they should have been placed. I had a few discussions with Messians about the infamous ROYGB order. I went with more of a YORPBGDark order ha ha! The important thing is that it works for you. These shimmering ones on the left are so dreamy and the Fragonard set had all of my favourites including the perfect shade of Payne’s Gray. 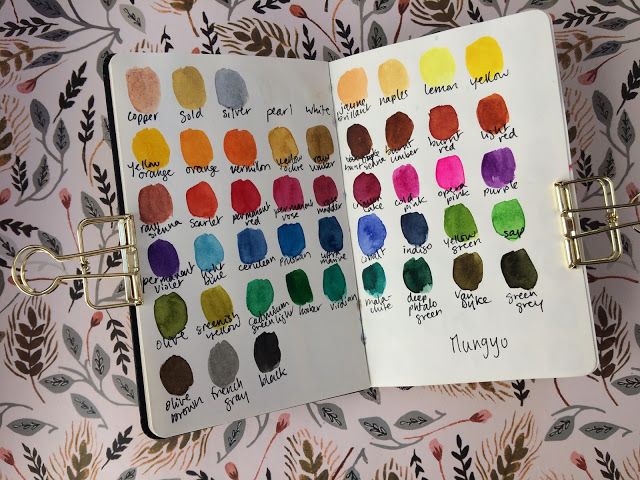 I also made colour swatches for the amazing Gouache set I found here. These colours are so appealing to me! The first page I made was a self-portrait using security envelopes. I loved this dark plaid pattern! Notice I added two of my Spirit animals there: the jackalope and butterfly. 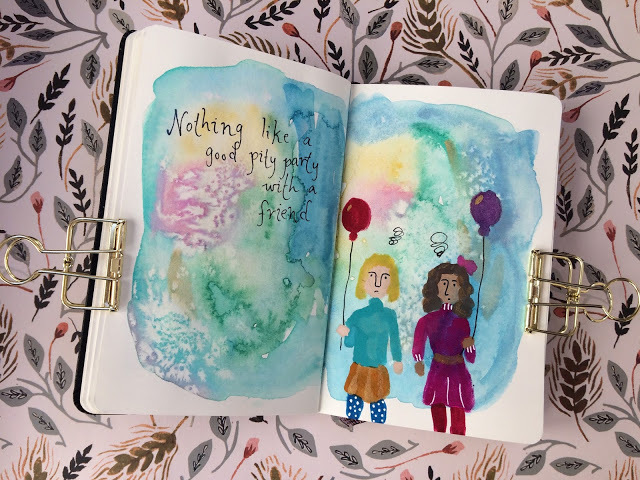 One of the goals of this week’s prompts was to connect to your inner child and just play. So I played with these soft watercolour backgrounds. Once they were dry, I added some doodles. 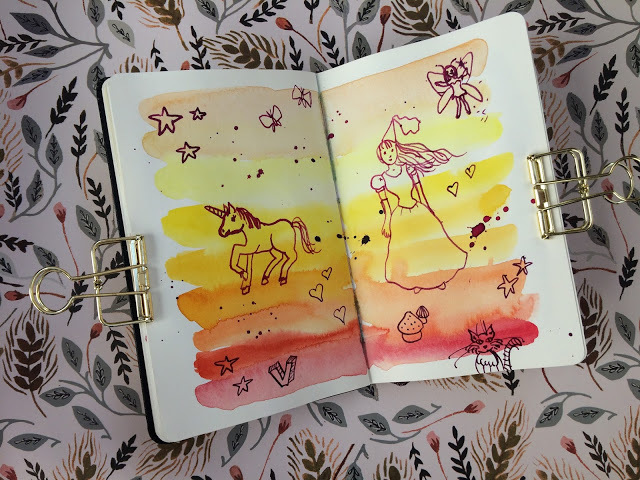 these are exactly the doodles I would make growing up: unicorns, fairies, cats and princesses. I felt that the sunny background fitted nicely with these. For the colder set of colours, I went with some doodles related to my profession and explored skulls. As a teenager and young adult, these would be everywhere in my planners, books, notes, etc. My tutorial this week was about exploring faces with gouache. 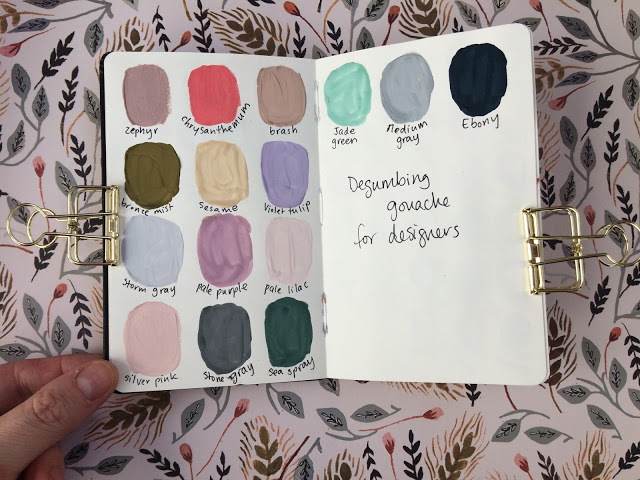 I enjoy gouache a lot and am looking forward to using it more in my journals. 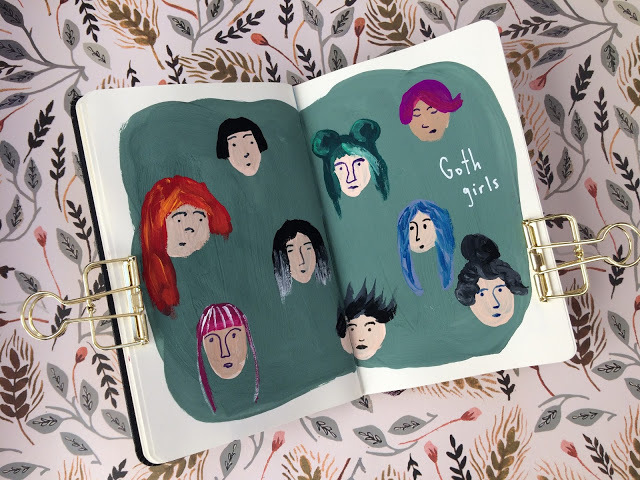 So in love with these goth girls. I played with my supplies, watching them blend and bleed. 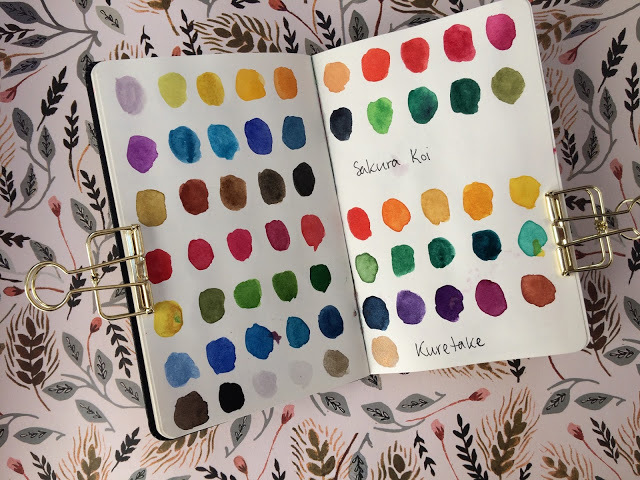 My final page uses both watercolours and gouache combined. I like this technique a lot and hope to integrate it to my arsenal. Thank you for coming by. I’m so excited to see where this Season will take us! 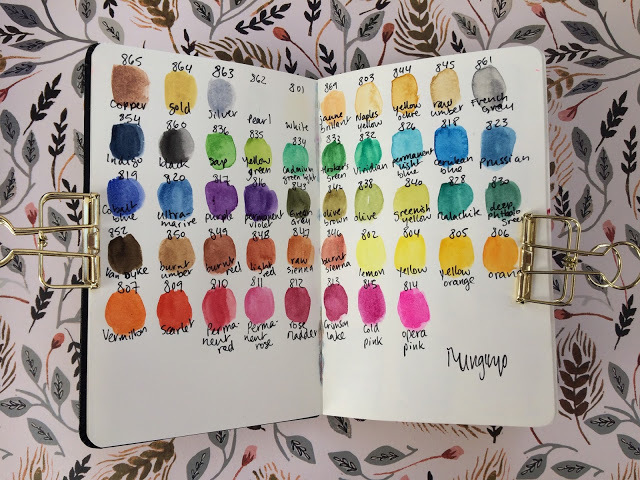 I love how the colours have interacted with each other on your last spread, I think I could sit and watch colours swirling and mixing all day, every day…& your Goth Girls amazing!! 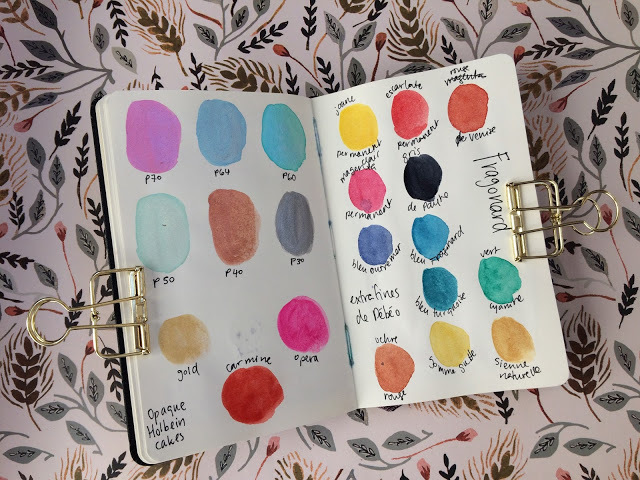 Adore the colour swatch play and your split of the colours into the warms and cools for different aspects of your life and the portraits are to die for! Love all your pages, V! really? I changed it to a white one this week! 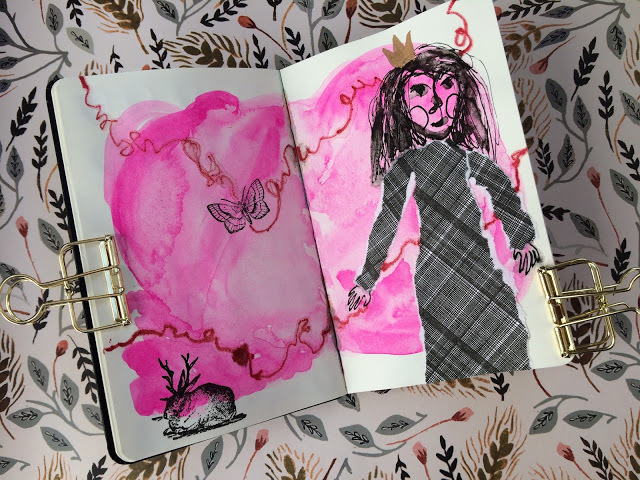 My favorites are the pink background with a queen and the princess and unicorn. Inspiring pages!